Another month, another pair of blocks for do. Good Stitches. This month Rachel from Stitched In Color had us creating granny square blocks, which are all the craze in the modern quilting community recently it seems. 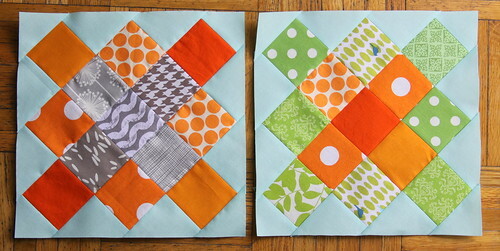 For my part, I made two blocks with Kona Aqua as the background. Our color palette was blue, green, teal, turquoise, orange, and gray. Sorry for the lighting in the photo - the weather here has been just awful lately, so I was forced to take a picture standing in our doorway.